Today we'll be comparing and contrasting some of the most popular upgrades available for Combiner Wars and Unite Warriors Devastator. The X2 Toys XS001 Devastator Upgrade Kit, The Perfect Effect PC-06 Perfect Combiner Upgrade set, and the Dr. Wu DW-P28 Hook upgrade. The X2 Toys kit is brand new and on loan to me from Blast Off Toys, and the Perfect Effect and Dr. Wu kits were included with my Takara Unite Warriors Devastator. The kits are second hand, as such I do not have the packaging and I can not guarantee that everything in the package is in mint factory condition but the items appear to be complete. I'm going to go over what's included with each kit, and show off the differences between the installed kits side by side. Let's get into it! - 1 Prowlestator replacement head for combined mode. Starting with the upgrade parts for the individual Constructicons we have a replacement shovel arm and scoop for Scavenger. The original shovel is attached via a mushroom peg that is easily popped off and the new arm slides on securely. The shovel is articulated at the center joint and again at the shovel base. The arm and shovel are much larger than the originally included shovel. I like the overall look of this piece and the color match is close enough that it works on either version of Scavenger. 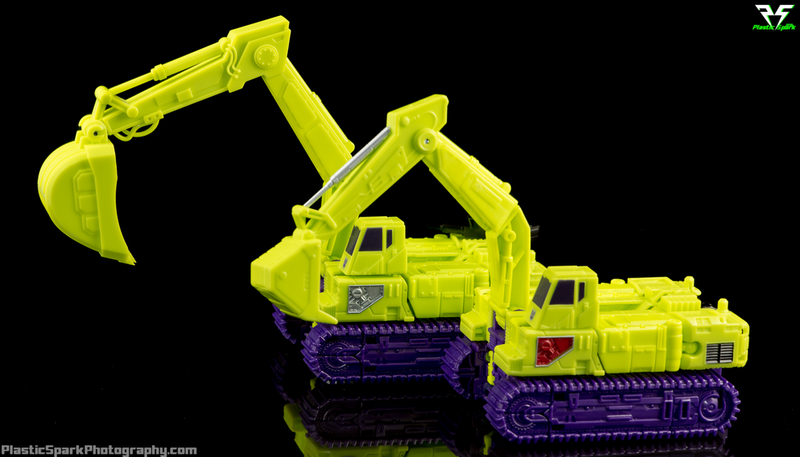 When combined the shovel sticks out a bit further than the stock piece so allow for a little extra room on the right side of Devastator in your display. The crane arm upgrade for Hook is a simple but effective set. The original crane is held in with 2 friction tabs and can be removed by applying a bit of force and pulling. The new upgrade piece splits in the middle and you install the original crane into the center. Finally there is a collar that slides down over the larger crane base that is now installed locking the halves in place. Once assembled this makes the crane arm into a 2 piece arm that is able to extend the length of the original arm. The crane looks great in vehicle and combined mode, however in robot mode it makes the crane arm too long and it has to be angled back quite far to allow him to stand up straight. It's a nice piece if you intend to keep Devastator combined or display the team in vehicle mode but causes too much trouble in robot mode for my taste. It's like one of those extendo-grabby majoobers! The cab cover for Mixmaster is an incredible add on and is probably one of the most important and effective pieces in this set. 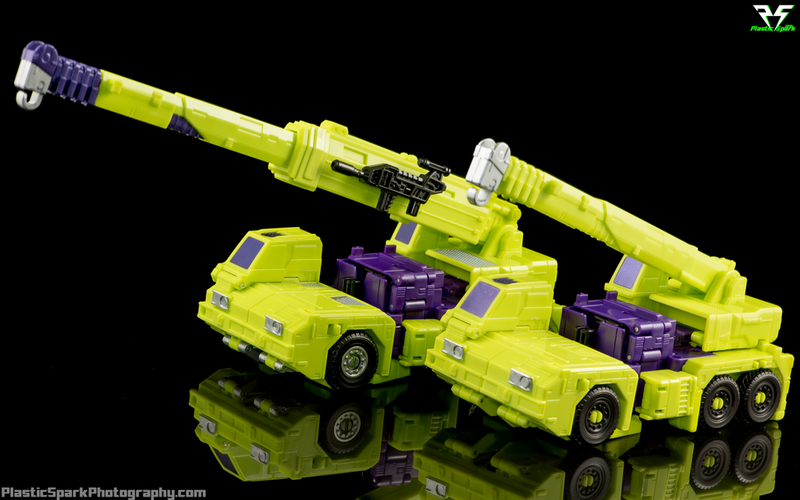 Since the announcement of Combiner Wars Devastator there has been nothing but contempt for Mixmaster's small cab foot, caused by his backwards mixer truck alt mode. Many of us had hoped that this would be fixed with Takara's Unite Warriors release but unfortunately despite the re-engineering of many pieces in the set, Takara chose to leave Mixmaster as is. Every upgrade kit released so far for Devastator has included an upgrade for Mixmaster and this upgrade is well worth the price of admission to fix the aesthetic of combined mode. The cab cover slides over the existing cab and clips on around the 3 pegs on the roof. On the Takara version this nullifies the mounting point for his weapon but it can be stored on one of the other Constructicons extra hard points. The cab is on a sliding bracket that allows it to slide down on his back for robot mode, and slide back into position for vehicle and combined mode. The larger cab looks great as the foot of Devastator and helps to solidify the vehicle mode as well. Hey look! A windshield you can see out of! The knee pads are pretty self explanatory. 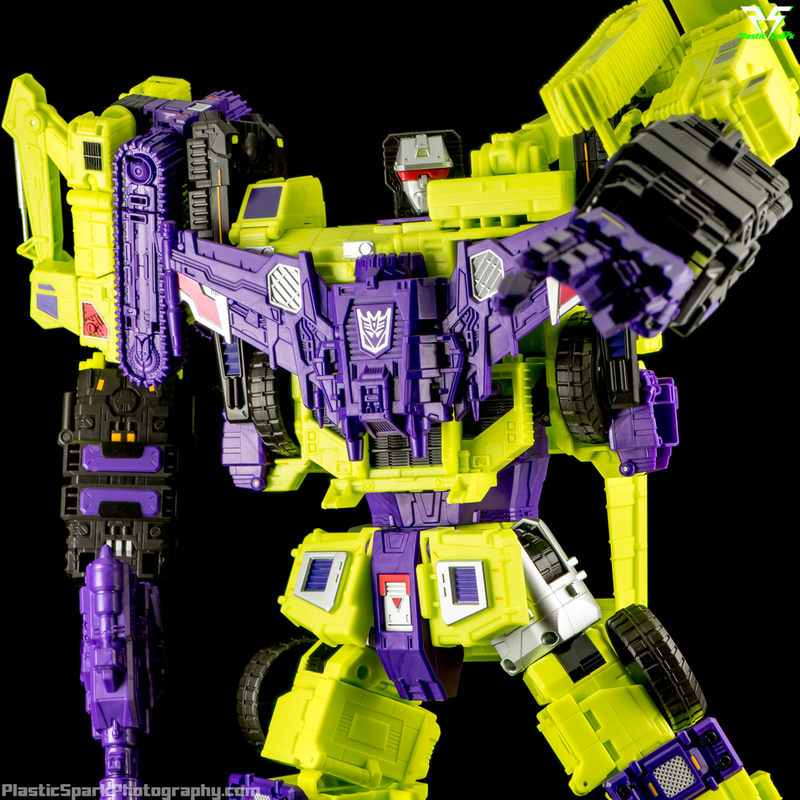 2 purple pieces that tab into the large rectangular holes in Devastator's legs. They look decent but for the life of me I can't get them to stay plugged in on either version of Devastator. The plastic these knee pads are made of feels a little soapy in comparison to the rest of the kit. The 2 replacement shoulder parts are very simple. Black moulded plastic with a few silver painted details, these parts add ratcheting shoulder rotation, outward movement, and allow for the treads of Bonecrusher and Scavenger to stay attached to them in arm mode rather than becoming part of the chest. 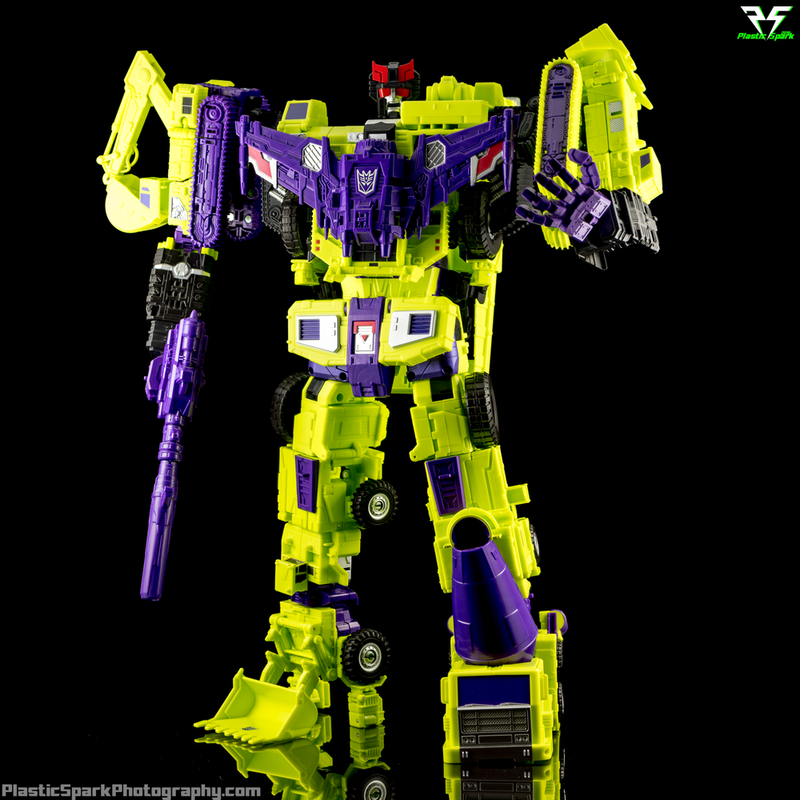 The new shoulder pieces cause Devastator to have an incredibly wide and bulky looking shoulder line. They lack any mounting points for Devastator's chest shield and the extra width puts a lot of stress on the connection points in Hook causing the seams in the chest to split due to the increased weight and leverage of Devastator's arms. The ratchet joints work well enough and do their intended job well. Unfortunately there is no way to lock the treads of Bonecrusher and Scavenger to their vehicle modes and the built in shoulder joints in the arm bots sometimes cause the arms to sag even though the upgraded shoulder parts are ratcheted. I personally don't like the aesthetic or functionality of the shoulder pieces at all and I can not recommend them as a valuable part of this set. Shoulder slippage. None of the kits fix this issue. The replacement hands in this set are actually very nice. They include a replacement extended wrist piece that snaps in to the original Devastator arms that gives them a slightly longer profile. The wrist portion has similar moulded missile pods on the back and they are painted red similar to the Takara version. The hands are one of the most impressive pieces in this upgrade set. Each finger is ball jointed at the base, with 2 pin joints for the knuckles. The thumb is on a ball joint at the base with a single pin joint knuckle. The hands can contort into a great fist, and due to the ball jointed bases he has a great finger spread allowing for some really dynamic posing options. The palm of each hand has a large tab in it to help hold Devastator's large blaster. The hands have a ball joint at the wrist with a large range of motion. These hands are great and I was really impressed with them given how mediocre the majority of the rest of this set is. The final piece of this kit is something that will only appeal to a small niche of users. Anyone familiar with the current IDW Transformers comics, (and if you're not this next bit is a pretty big spoiler) particularly the Robots in Disguise title, will know that Prowl was forcefully combined with the Constructicons by Megatron, in order to revive his monstrous combiner weapon without Scrapper, who had previously been dispatched by Spike Witwicky on earth. Prowl replaced Hook as the chest and head of Devastator and Hook took Scrapper's previous place as a leg. The resulting combination has come to be referred to by the fan community as Prowlestator. A version of Devastator incorporating Prowl's cruel and calculating strategic abilities with the raw power of the Constructicons. Perfect effect included a small chest piece replicating Prowl's black and white deco, with a deluxe size Prowl head on a ball joint. The deluxe size head is well painted and has a nice sculpt with a neutral, grumpy expression. The next portion of this upgrade is the larger combined mode head. The head slides on over top of the deluxe sized Prowl head and uses the existing ball joint to allow for full articulation. 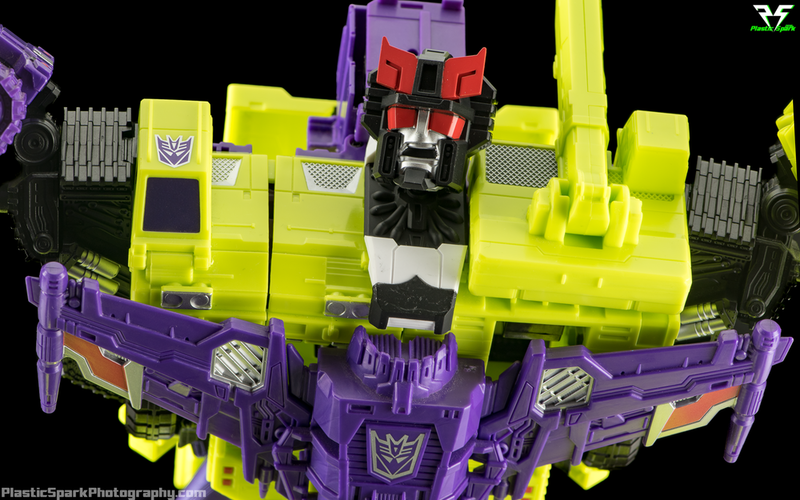 The head design from the comics is an amalgam of the original Devastator head with Prowl's signature red forehead crest. Devastator's red visor has also been split into square, crimson sunglasses. His mouth is moulded in a fantastic shouting snarl with painted teeth and black paint on the inner mouth. The finish is fantastic and all the details are incredible. This piece is fantastic and I honestly wish Perfect Effect had included a replacement regular Devastator head with this kind of detail and expression as well. Along with the replacement hands and Mixmaster cab, this is a highlight of the set. Plastic and build quality are great with the exception of the slightly soapy feeling knee pads. That wraps it up for the Perfect Effect PC-06 Perfect Combiner Upgrade kit. Let's move on to the X2 Toys set and see how it stacks up. - 2 Fully articulated hands. The X2 kit only includes one upgrade piece for the individual Constructicons; a replacement cab for Mixmaster. The kit slides over the top of the existing cab and clips in very tightly onto the existing door handles sculpted on to the side of the original cab. This piece can be incredibly hard to remove so make sure you like it before you snap it in tight. Unlike the Perfect Effect upgrade this one does not slide down in bot mode so Mixmaster ends up with a huge box around his head. In vehicle mode the cab sits incredibly high and looks very awkward as the cab of the vehicle. Some sort of fold down piece to bring the bottom flush to the ground would have helped the aesthetics a lot. In combined mode the cab is an improvement over the original tiny foot but still looks a slight bit too small for the rest of his body. New floating cab feature. What were they thinking? The knee pad covers again are very easily explained just by looking at the photos. They peg into the large rectangular hole in the legs of the combined mode and hold better than the Perfect Effect knee pads, although they still are loose enough that they may fall out while manipulating Devastator. Mom always said to wear your knee pads when you go out crushing Autobots. This kit also includes replacement hip flaps for the combined mode. They are slightly smaller than the stock flaps and have slightly different detailing. The vents are painted purple rather than the black vents on the Combiner Wars version. The color swap may be worthwhile if you have the Hasbro version but there is very little reason to swap these parts on the Takara version unless you want barely noticeably smaller hip flaps. You there! Can you spot the difference? The X2 Toys shoulder upgrade parts are a bit more complex than the Perfect Effect offering. They add ratcheted shoulder rotation and outward movement as well as a forward butterfly joint. They connect using the default shoulder connectors as well as the 5mm peg holes in Long Haul's fists. There is a small green T-bar piece that connects to the inside of the treads on Bonecrusher and Scavenger. They raise Devastators shoulders far above his head which gives him a hulking stature but to my eye looks unnatural from head on. In more dynamic poses the shoulder positioning is not quite as noticeable but still looks a bit awkward sometimes. I don't personally care for the high shoulders but the look works for some people. It's all a matter of preference. The ratchet joints are strong and capable of holding most positions however the original shoulder joints are not locked in on this kit either so they may sag in certain positions. The addition of the forward butterfly joint is fantastic, and would only be better if it was a tighter joint and maybe had some backward movement as well. Is this as uncomfortable as it looks? X2 Toys included 2 replacement mounting pieces for the shoulders. These require dis-assembly of the black shoulder pieces and replacement of the bright green connectors inside. This process is fairly simple but there are a few critical steps that must be done in the right order. The screws are all different sizes, so make sure not to mix up which holes they go into. The new pieces are supposed to lower the shoulders from their unnaturally high position, however I found the difference to be almost impossible to detect. I would consider these to be spare parts more than an optional aesthetic difference. The new forearms are massive with a hinged door on the underside to allow you to connect them onto Devastators elbow stumps. They plug in to the same ports that the original factory forearms connected to. In order to install the new hands you must remove the wrist mount from the original forearms and slide the original hands out of the mushroom peg. This connection is very tight and can be a bit of a pain to get out. I was able to do it all bare handed with a bit of force and I would recommend avoiding any sort of tools to prevent damage. The hands can be folded up and flipped inside the forearms to create huge rocket launchers with flip out handles on either side of the arms. The new forearms and hands are quite heavy and cause the elbow joints to sag in almost any dynamic pose. I'm still trying to figure out a good way to stiffen up these joints. He can pull off a nice goon knuckle crack. Similarly the X2 Toys new hands for Devastator are gigantic. They are easily 50% larger than the stock hands or the Perfect Effect replacement hands. The fingers have ball joints at the base with pin hinges on each finger at the knuckles. The thumb is ball jointed at the base with a single knuckle hinge. The ball joint on the thumb is really only useful as a swivel due to the way it is designed. The hands are nicely articulated but I find they look less natural than the Perfect Effect kit, especially when folded into a fist. As long as you don't mind the larger look of the forearms and hands there really isn't anything to worry about with these parts. 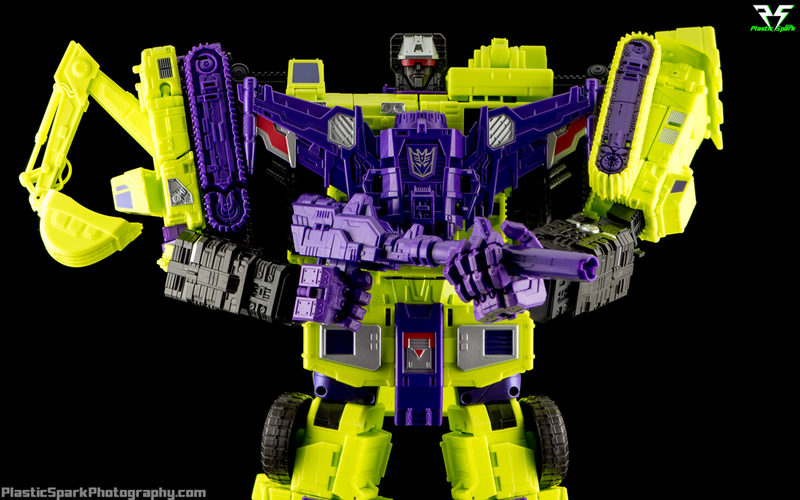 There is a black gun handle add on included to allow the larger hands to hold Devastator's blaster. In a rather unique choice, rather than any sort of tab or slot on the palm the fingers have small slots at the base of each finger that peg into the gun handle add on that is included. The connection is fairly solid but can take some fine tuning to get everything pegged in solidly. It's all about the angles. He's got a good side. The plastic quality of this kit is great, everything feels solid and polished. The green connectors on the shoulders feel a bit thin but so far I haven't noticed any stress marks or anything to be concerned about. Available as a separate upgrade from the legendary Dr. Wu, this upgrade is a simple replacement for the factory installed crane arm on Hook. It is compatible with either version but lacks the purple paint application of the Takara crane. The crane is extendable with 3 sections and has a larger hook on a simple hinge. I really like the look of this crane on Hook's vehicle mode and it gives you an option to extend the crane boom without causing any issues with the robot mode as it fits perfectly. The plastic quality is great and I intend to leave this piece permanently attached to my Takara Hook. Now with 100% more dangle! It's been quite a task testing out all of these various upgrades. It's no question that the stock Devastator set has a few glaring issues. The replacement Mixmaster cab is a must for combined mode and between the two I tried I greatly preferred the Perfect Effect version. 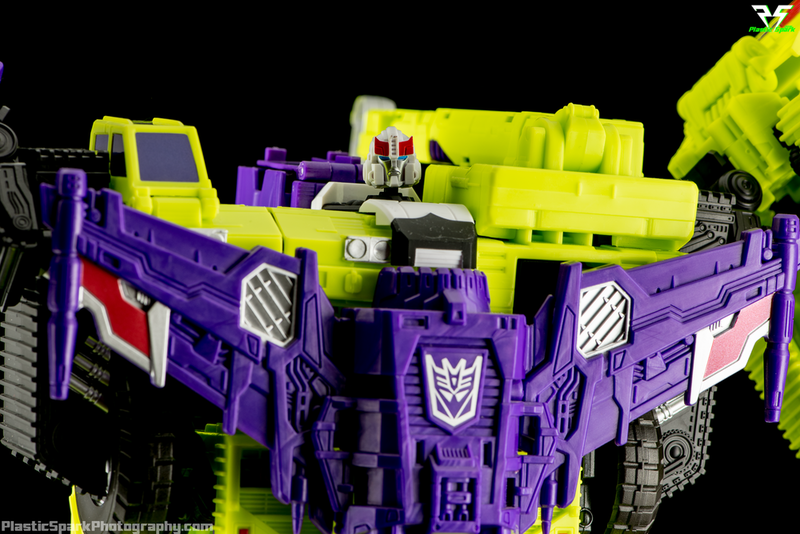 It fits in with the vehicle mode without any strange gaps and looks fantastic as Devastator's foot. The ability to slide it back on Mixmaster's robot mode is a cherry on top. Neither of the shoulder add-ons really wowed me. They are built well but there are oversights by both companies that keep either one from getting top marks. I find I prefer the stock shoulder assembly over either of the third party options I tried. The hands on both sets are really nicely built and articulated, but I'm not a fan of the oversized forearms and hands on the X2 set. Of the two sets I have in hand I prefer the look and articulation on the Perfect Effect set. They form more natural fists and the size is more proportionate to the rest of Devastator. The knee pads and hip flaps in either set are superfluous and really don't do much for me either way. The additional heads and chest piece in the Perfect Effect set are incredible and I absolutely love them. That being said I'm not likely to display my Devastator in this configuration so the pieces are not really a selling point unless you are after a Prowlestator for your IDW display. It's nice to have the head option but without Hook as a leg the combined mode is already inaccurate to the source material enough that I won't be displaying him in this mode. Both kits bring some worthwhile upgrades, as well as some less than satisfactory pieces to the table. At the end of the day I think it's up to your personal aesthetic preferences. If I had to pick a kit to recommend it would probably be the Perfect Effect kit as the included vehicle mode upgrade pieces add a lot of value to the set and I prefer the hands and forearm upgrade options as well as the Mixmaster cab in this set. Currently I have my Takara Devastator displayed with the PE Mixmaster cab, Forearms and hands, and shovel piece for Scavenger as well as the Dr. Wu Hook add on. My preferred configuration using parts of the PE kit. I want to give a big shout out to Blast Off Toys for loaning me the Hasbro Combiner Wars Devastator set as well as the X2 Toys XS001 Upgrade kit for this review! Check out the gallery below to see high resolution photos including comparisons between both upgrade kits and the default combined mode. What do you think? Is there anything that stands out to you about any of these upgrades? Do you have any questions about these kits, or the Devastator sets at all? Let me know in the comments section below!